This one kind of snuck up on me. Forgot it was even coming out. Weird, right? My Cousin Rachel is a period drama/romance based on a novel written by Daphne Du Maurier, legendary for her stories “The Birds” and “Rebecca” and their adaptations by the legendary Alfred Hitchcock. It was first adapted into a film in 1952 and, among fans of the novel (I like the author but have never read this particular work, heard plenty about it though) it is revered for the performance of Olivia de Havilland as the titular Rachel. Due to this there was a small but sturdy cry from these fans when a new adaptation was announced. I learned all of this recently and had no objections to Rachel Weisz playing the role because…well, having not read the book or seen the original movie it just isn’t precious to me. Weisz, however, is very much an actress I’ve enjoyed all my life. From the 1999 action film The Mummy to Darren Aronofsky’s stunning thought-piece on death The Fountain, she’s been at the least fun to watch and at her best absolutely magnetic, with every performance being strong and well-rounded. So when I saw her in the cast a few months back I made a note to check it out at some point and then filed it away for later. After all, there’s a lot of interesting stuff coming out this year. So when I found surprise Rachel Weisz in my theatre’s newsfeed I remembered this film and decided to check it out. It was an absolutely wonderful and I’m so glad I went for it. The plot revolves around Philip Ashley (Sam Claflin) as he investigates the death of his cousin Ambrose. Taken in as a boy, Ambrose raised him but died young. Philip has received rambling, paranoid letters that accuse his cousin’s wife of poisoning him, of slowly bringing him to his death, and of spending all of his money frivolously. Philip arrives at the manor with the full intention of ending her life, his rash character a continuing thing in the film. His godfather Nick Kendall (Iain Glen) and Nick’s daughter, Louise (Holliday Grainger) accompany him for much of the film. As Philip gets to know his cousin he begins to believe that she is innocent and a strange romance forms between them. The ambiguity is crucial to the film and is interesting in a way I had not predicted. I’m not often fond of this type of story. So many different versions of the gothic, period drama/romance will appear on the Hallmark Channel or in DVD bargain bins, but here director Roger Michell (Notting Hill, The Mother, Venus) does something very intense and quiet. The rumblings only exist beneath the surface, spurting forth in little spats, but exists as an underlying discomfort. It very much resembles a real relationship, albeit an unhealthy one. Communication is key and while these two communicate they come from different walks of life and ideas, a modern woman of middle age and a very young man of old-fashioned feelings. I stated before that his rash actions continue through the film, and they have a profound effect on his arc. Rachel remains who she is throughout the film, but Philip behaves as a man without thought. He makes snap decisions that he thinks are bold or exciting or brash, brazenly pushing them forward despite anyone and everyone telling him they are bad ideas. He goes through with each of them anyway, rarely understanding what his cousin Rachel is saying to him through both spoken language and behavior. While I immediately latched onto the plot and performances, the way this film is shot baffled me for a little while. As a gothic period drama we get a lot of the hallmarks – slow, sweeping shots of the landscape that are few-and-far-between but powerful to look at as well as the intimate shots of…well, conversation. But then there are these quiet, off-putting dutch angles that add to the moral ambiguity of each character. You see them as skewed, as towering over one another and constantly switching between who has the upper hand, and eventhe odd overhead shots in the dark that leave them barely visible. It’s an odd thing but once you sink into it I think it works marvelously. Rael Jones, who I was unfamiliar with before some Googling, composed the score to the film. It is mostly on a piano with a small orchestral section in the background, and is very eerie and uncomfortable to listen to. There are no stings, no aggressive jumps, and no overly fancy flourishes. The music, instead, just exists atmospherically. Jones has worked with Michell before as a music editor but this looks to be his first score (though he also did some editing work on this year’s Beauty and the Beast for Disney). It’s an enhancing score that does a lot for the tone of the film and comes off as blunt, but not in a bad way. 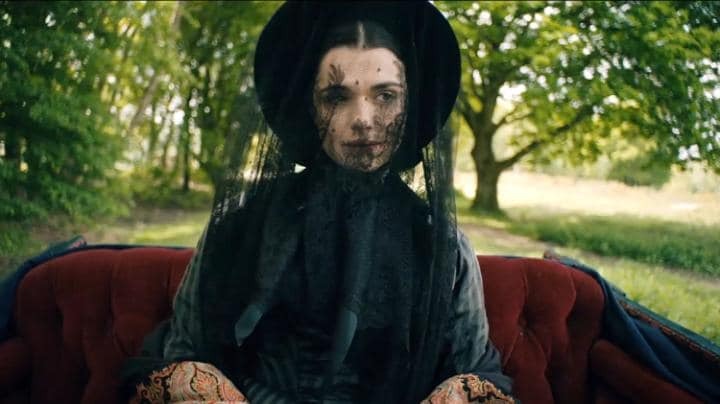 I was very much surprised by this film in a multitude of ways but for those who are on the lookout for more Rachel Weisz, Roger Michell, or just plain old gothic romance then this is worth checking out. It’s an old idea in terms of nearly everything about it, from the setting to the story to the technical aspects, but it’s so well-executed that it manages to remain fresh and interesting despite bringing little new to the table.